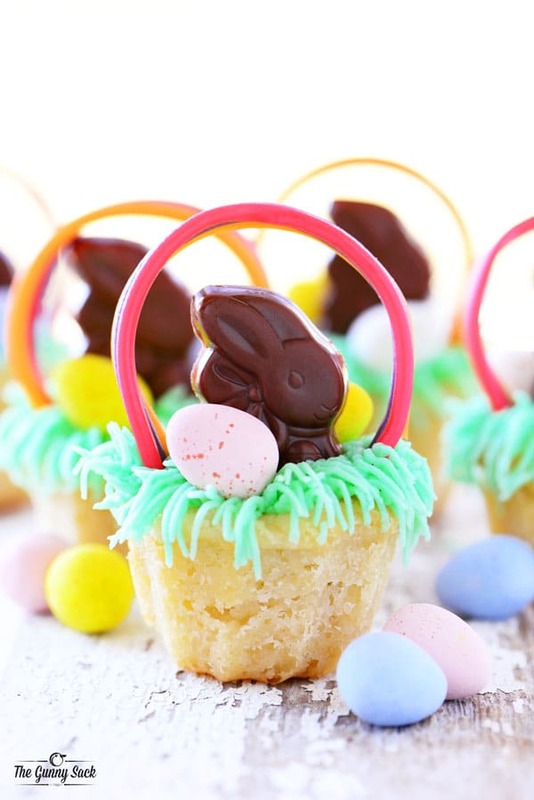 These adorable Easter Basket Cookie Cups are almost too fun to eat! 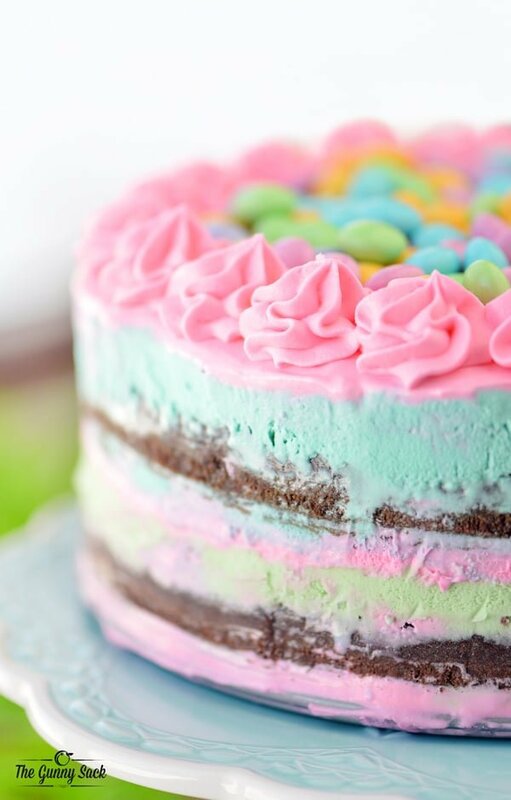 An Easter dessert recipe filled with buttercream frosting, chocolate bunnies, and chocolate eggs. 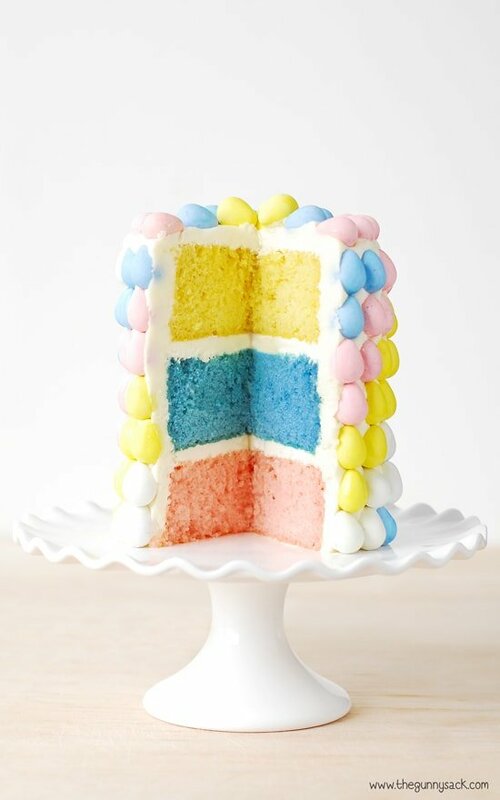 Easter treats with all their cheerful pastel colors are just the thing we need after a long winter! 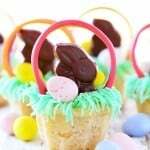 I’ve been wanting to make these Easter basket cookie cups for a couple of years now. The problem is that I ran out of time each year and that I wasn’t quite sure how to make them. I thought about using green colored coconut for the grass, but my kids don’t care for coconut. Next, I thought about using green licorice but wasn’t sure how well that would stay in place. 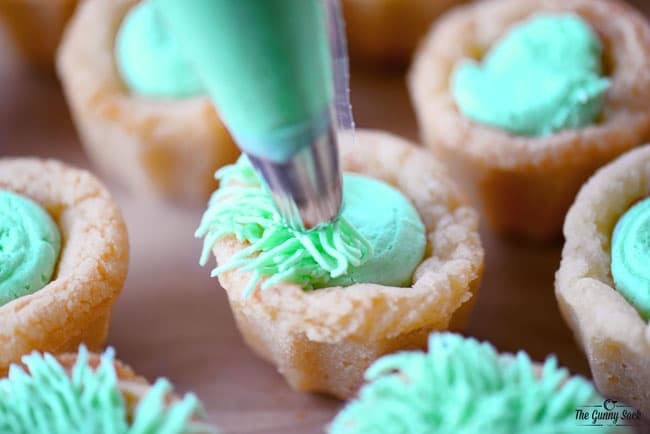 Finally, I discovered a decorating tip that makes buttercream frosting look like grass and I knew it would be perfect for the Easter basket cookie cups! Where is the recipe for Easter Basket Cookie Cups? In this post, I will share step-by-step instructions with photos for how to make the cookies, as well as answering FAQs about the recipe and sharing a short video showing the recipe in motion. But you can go directly to the recipe by scrolling down to the bottom of the post. My original plan was to use my silicone mini muffin pan to make the basket part of the cookie. But just before getting started I remembered that I had a silicone mini Bundt pan that I ordered to make a pumpkin dessert last fall. I realized that the mini Bundt would make a super cute basket. To make the cookie cups I used Pillsbury Ready To Bake Sugar Cookie Dough. Since the silicone mini Bundt pan cavities are larger than the ones in the mini muffin pan I typically use, I used one and a half of the cookies dough squares in each cup. 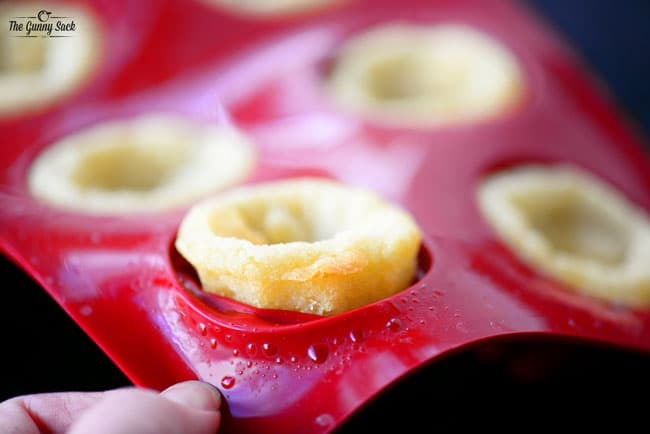 Place the silicone mini bundt pan on a baking sheet for stability and bake at 375 degrees for 15-19 minutes (or bake for 12-14 minutes if using a mini muffin pan). Allow the cookies to cool completely before removing them from the pan. When ready to decorate, beat softened butter and shortening until light and fluffy. Mix in the powdered sugar one cup at a time. 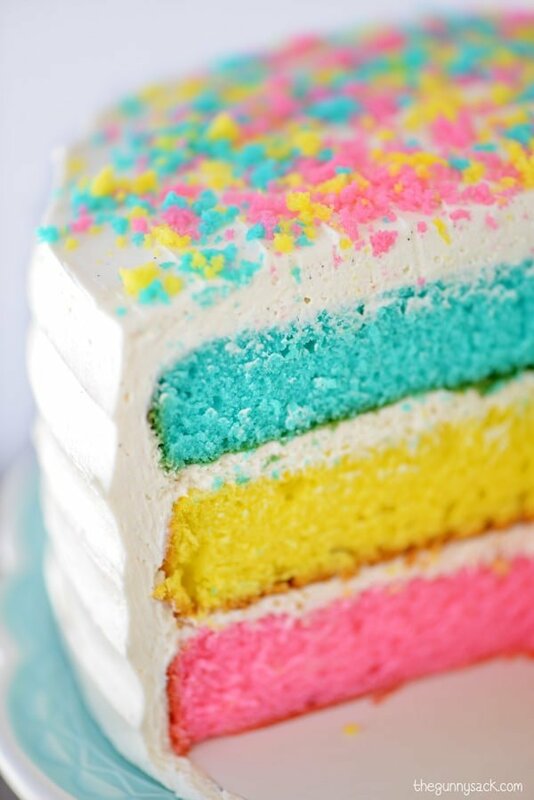 Then, beat in one tablespoon of milk at a time until the frosting is the desired consistency. Stir in the vanilla and Wilton green gel paste icing color. Use a pastry bag to fill each cookie cup with frosting. Then, use Wilton decorating tip #233 to make buttercream Easter grass. So here’s the thing, the handles were the most difficult part of these baskets. I used Twizzlers Pull n’ Peel Fruit Punch candy and it wanted to continue twisting. There are nine colored strands in each licorice twist. I peeled the licorice apart in threes and cut each length in half. So, I laid the strands down flat on a piece of waxed paper and held the ends down with glass cups to help them flatten and dry out for an hour or two. Press the licorice ends into the frosting and keep your fingers crossed that it stays in place. And if it’s too frustrating, don’t add a basket handle. The treats are fun without them too! 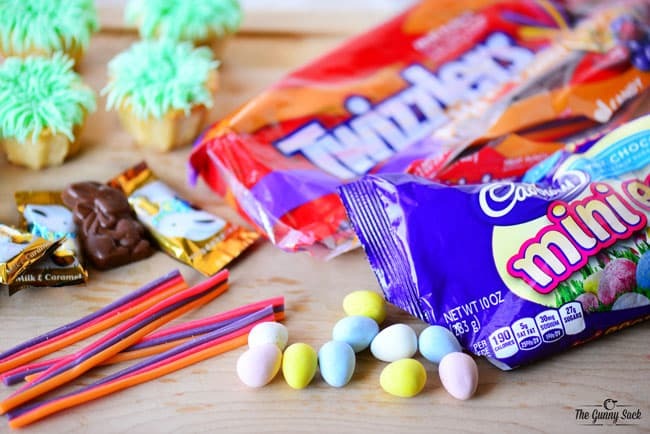 To complete the baskets, I added Ghiradelli Chocolate Caramel Bunnies and Cadbury Mini Eggs, but use any of your favorite Easter candies to decorate the baskets! These Easter Basket Cookies Cups turned out so adorable and we delivered them to my nieces and nephews so that we weren’t tempted to eat all of them! 1. How can I make these in a mini bundt pan? For a mini bundt pan, use 1 1/2 squares of Pillsbury Ready to Bake Sugar Cookie Dough or 1 1/2 tablespoons of homemade sugar cookie dough. 2. How can I make the Easter baskets in a mini muffin pan? For a mini muffin pan, use 1 square of Pillsbury Ready To Bake Sugar Cookie Dough or 1 tablespoon of homemade sugar cookie dough. 3. Do I need to do anything different when using a metal pan? If using a metal pan, instead of a silicone pan, you can roll the cookie dough balls in sugar before placing them in the pan to help prevent sticking. Cut 8 of the squares of cookie dough in half. Place one full square and a half square (or 1 1/2 tbsp of homemade sugar cookie dough) in each of the greased silicone mini bundt pan cups. (I only have one pan so I had to bake the cookies in two batches to make all 16 cookie cups.) 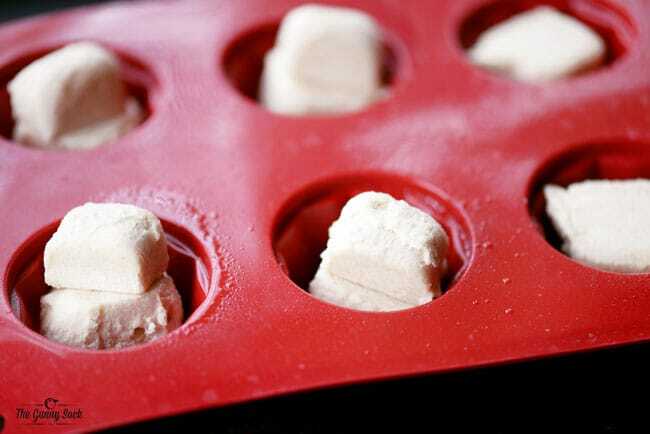 If using a mini muffin pan, use 1 square of Pillsbury cookie dough or 1 tbsp of homemade cookie dough. Put the silicone pan on a cookie sheet and bake at 375 degrees for 15-19 minutes for the mini bundt pan (or 12-14 minutes for a mini muffin pan). Allow the cookies to cool completely before removing them from the pan. Use a pastry bag to fill each cookie cup with frosting. Use Wilton decorating tip #233 to make buttercream grass. Complete the Easter baskets with chocolate bunnies, licorice handle, and eggs. Beat softened butter and shortening until light and fluffy. Mix in the powdered sugar one cup at a time. Then, beat in one tablespoon of milk at a time until the frosting is the desired consistency. Stir in the vanilla and Wilton green gel paste icing color. How did you get the dip in the middle of the cookie cup for frosting? Mine just baked up and I had to make the hole myself. No where in this recipe do you even talk about the hole in the middle. These are just super cute! My girls would love them! 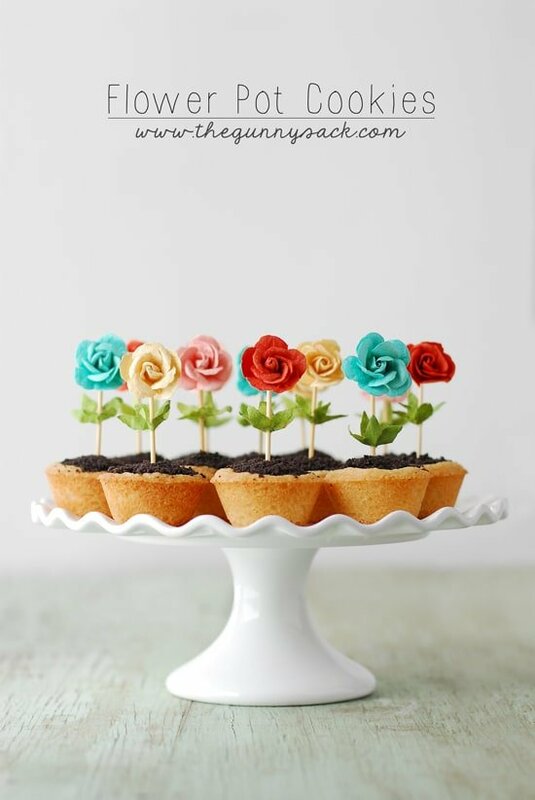 My kids have outgrown Easter baskets, but they would love these cookie cups just as much! These are the cutest!!!!! LOVE this idea! Your pictures are beautiful! 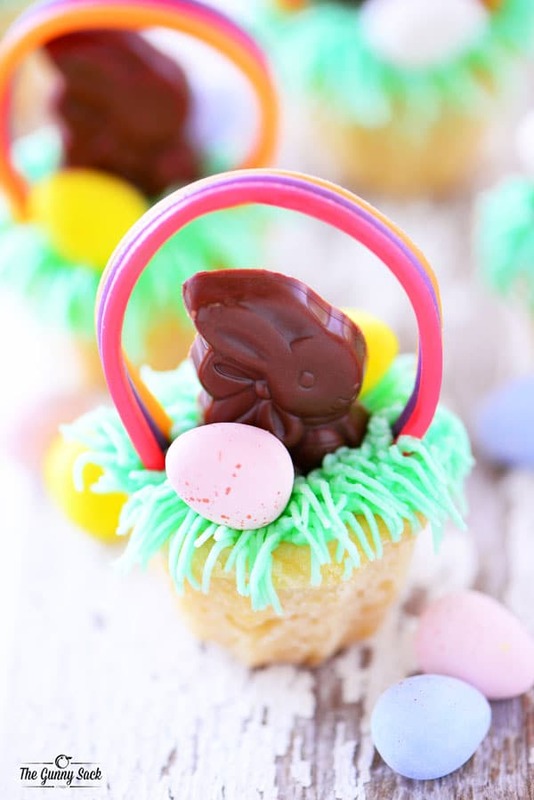 Really cute ideas, I’ll be trying a couple out this Easter! I love these! Cute enough to double as a center piece! These are so cute! My nieces would love this! These are just too cute!! Love this idea! These are the cutest things ever! I have got to make these with my niece! These are too adorable – you are so talented Tonia! This are just simply adorable! Simply adorable! And so perfect for Easter. These are utterly charming. They’d be a hit on any Easter sweets table and would be the talk of the meal. Oh my gosh! These are the cutest! 🙂 Love that you use a mini bundt pan to make the cookie cups. Pinned for sure! These are so adorable! Great recipe to do with kids! I love all your sugar cookie recipes! These are SO adorable. I dub that tip my “grass tip,” lol. I love it, especially for Easter! And these are just so cute!! OH MY these are just too darn cute! Pinning now.